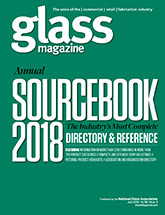 The Glass Magazine SourceBook features nearly 1,200 suppliers in more than 700 product categories, providing contract glaziers, fabricators and retail glass shops with an invaluable research tool when they are looking for new vendors. Click here to view the digital edition of the 2018 SourceBook. This electronic version of the directory offers live links to supplier email addresses and web sites to make it as easy as possible to get the information you need for your business. If your company was not included in this year's directory and you would like to be included in the next print edition, click here to download a listing form. Please note: Our goal is to make the SourceBook as comprehensive as possible, with a focus on companies actively serving and selling to manufacturers, distributors and dealers in the architectural glass market in North America. While listings are free, we reserve the right to edit all submissions and do not guarantee inclusion of all companies.